ADP Vantage offers integrated tools including HR Payroll, Workforce Management, Benefits, Recruiting, Talent Management, and Employee Onboarding. Additionally, the Self Service options enable hiring managers to gain complete visibility of their recruitment efforts and hire the best talent available. Employee and Manager Self Service solutions streamline the onboarding process. 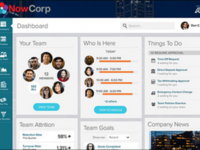 The built-in Talent Management solution helps to sync employee performance with company goals. ADP Vantage HCM Reviews Recently Reviewed! Comments: Make sure to do your research if you are considering ADP, it's a huge company and that comes with benefits but it's important to know where they may fall short in servicing your needs as well. Pros: ADP can be used for small or large businesses depending on the needs of payroll. What's interesting about the product is that it can be very versatile. The product is very easy to navigate and maneuver once you are trained. They have multiple extensions that you can dig into as well if you are looking to expand. Cons: I've used ADP with a couple of different companies of varying size and while it's great that it can flex between large and small companies. I found that the customer service was a challenge at both companies. Payroll companies offering a dedicated resource for a contact is really important especially when related to time sensitive matters. Pros: The system has good function and ideally can work well with users as the dashboard is quite user friendly. It can take some time to get use to and learn but when using integrated functions it can server quite useful. There are great measures taken for security which is good but at the same time can be frustrating when admin users have to log in many times everyday. Reports are robust and fairly easy to navigate. Cons: Many of the integrated functions can cause issues with one another. Unfortunately being so big there are many departments that handle different items and it seems that some departments always seem to say they cant speak to something even though they should know how the integration of one function impacts the area they work in. Still not big on extreme customization this has not changed from when I used them many years ago. Big business as one would think. Overall: System is visually nice and user friendly. After working in payroll for a very long time I was surprised to see some options not available for such a large company that smaller payroll software companies were able to accomplish. As far as straight forward payroll processing, benefits etc it works well. Pros: I like the HRIS and payroll portals. They are pretty consistent with other products out there and is easy to navigate. The new versions are great, especially since they have periodic upgrades with no interruptions. The help definable help, is needed. Cons: I am not the excited about there time and attendance or their background screening. The time and attendance system has its pros and its cons. Cons to me, are that it can be a bit confusing to manage the CA violations on the time card because it combines all hours on the time card view. For DOT purposes, I need to view total hours for the day, starting at the beginning of the shift to the last clock in, and that is something that I am unable to have done through a report. Recommendations to other buyers: ADP is a good product when it comes to the HRIS and payroll aspect, I have never really had any issues with them in that aspect. I recommend if you do go through an implementation with them, that you stress that it is imperative that all counterparts communicate with each other. I have noticed that, the more they grow, the more they loose communication with how each setup affects other setups within the system. For Example: Benefits is not always aware of the impact that a setup might have on the payroll side during implementation. The support team is better at this than the implementation team. Pros: ADP is probably the largest payroll vendor in the nations, which is good and bad. It's great because they are experienced with typical payroll processing, human resources and benefits. It's not so good if you are a smaller company or a company with out of the ordinary payroll functions such as agricultural operations and taxes, California "special" tax issues, and the like. Cons: Although they say their customer service is first rate, we have found it not to be so when it comes to the typical needs such as payroll issues. They have a great team of specialists in Time and Attendance, Reporting, but generally we are on hold at a minimum for 15 minutes, more typically half hour and longer. We have complained and it seems that they are hiring more staff and our calls are responded to more promptly. They also have a great support center and something called the Bridge where users can chat with other users about similar issues. Recommendations to other buyers: If you are looking for a well oiled machine to run simple payroll functions, and someone to take care of all the compliance with taxes, ADP is perfect. Don't be afraid to speak up if you have issues, the squeaky wheel gets the grease. 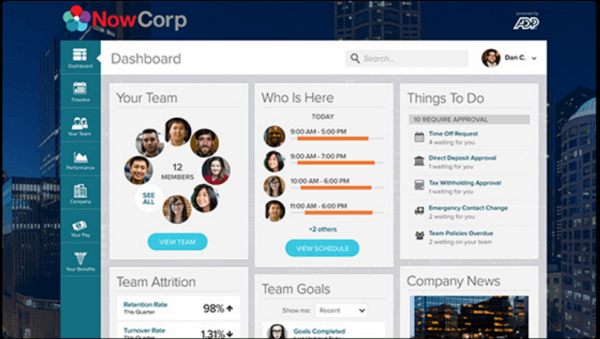 Comments: WorkForce Now provides fields to capture a lot of employee data. In the case of our organization it does require quite a bit of time and manpower on the front end to set up a system to utilize these fields effectively. We issue a lot of equipment to our employees. Much of this equipment has calibration and serial numbers. WFN has the fields to capture this data. The challenge is developing the structure and fields to capture this data. The same is true with the document cloud. Annually our company is required to generate a lot of documents for our employees. These documents need to be retained. The documents include drug tests, background screens, company policies, etc. Structuring the storage of these documents is critical to their ease of accessibility. ADP's provision of an advisor to help develop these structures would be a welcome service. Open enrollments, benefits administration, and payroll are WFN's strengths. The recruiting and applicant tracking system is not very robust and well behind the technology of other vendors. We recently switched to ICMS. Customer service in regards to payroll is good but not outstanding. Customer service from the Benefit Service Center is inconsistent at best. Recommendations to other buyers: ADP provides a lot of standardized training through online recorded classes and webinars. They do not provide much one-on-one training with the system. When implementing ADP WFN it is advisable that your team be lead by someone with HRIS experience who will recognize your needs and aggressively pursue ADP to meet these needs and provide solutions. Pros: its cloud/ web based. The potential is there but the system easily frustrates our employees and I can't really think of anything positive to say. Every advantage ADP offers comes with a "BUT"
Cons: Very limited, have to find work around for nearly every aspect of HR. Can't view time cards remotely without allowing punching access Self Service is very frustrating Here's some recommendations: a) life events that can make changes to the employee's benefits (add employee-take away employee; not just dependents) b) give users the ability to change beneficiaries to dependents/beneficiaries c) work flow for additional compensation d) allow there to be more then 1 work event template for a specific group Also, that "you can only have one window open at a time" not only is very debilitating but annoying when the cookies get stuck and one has to reboot the entire computer. Basically, ADP feels like a yahoo blog template with limited abilities; I'm working in a box within a box. Recommendations to other buyers: Don't understand this question. Think more "Outside the Box"
Pros: It enables you to easily enter the hours one has worked for a particular day, you can track your available vacation and sick days. This platform is rock solid, easy to use and the print out one receives after each paycheck is easily understandable. That is the reason why most employers in the US use it!!! Pros: The ADP platform is very user-friendly. it can make your tasks easier. As for the vendor, one can appreciate their flexibility and willingness to improve based on experiences and client needs. Cons: What I dislike about workforce now are some of the modules like benefits, the time-off request module, and the new notifications. It is not very flexible. For example, if an employee submits a time-off request that is inaccurate the administrator cannot correct the request without canceling and creating a new request even though it has a view/edit button. Some of the benefit configurations are not easily editable by the administrator and the new notifications module still requires too many clicks to get what one needs. As for the vendor, they can definitely improve on overall customer service and service delivery. Recommendations to other buyers: if you are a business with 50 to 2000 employees Workforce Now is the ideal product for you. It has lost of easy self-service tools that can allow any administrator to easily manage their workforce. As we know no product is perfect but this particular ADP product is at the very least one of the TOP software models. Comments: I have worked on the ADP Human Resource Benefits system for over 5 years. As a solo HR practitioner it has been good to have a HCM system, however ADP was selected first for payroll and A/P and time tracking. We have made the system workable for recruiting, performance management, etc. but any customization has been a challenge. Pros: Would not be able to manage recruitment as easily without the on-line application portal. It has some limitations, but allows for communication with the candidates and automatic transmission of data when an individual is hired. Employee Self Service allows staff to easily change their address, emergency contacts, etc. Cons: It's difficult to customize in the manner we would like to. For our size company, we do not have a dedicated customer service group so calling in for customer service you get varying levels of competency with the rep who answers the phone. Unemployment compensation services are extremely poor - missed deadlines, lack of response, delays in processing. Would not recommend using this service, ADP outsources it. Recommendations to other buyers: We just finished looking at vendors because our frustration level with ADP was so high. I would evaluate Paycom and Paylocity as well if you are considering a new system for a smaller company. We have had mostly good experiences with ADP software. Pros: I have found most of the customer service to be outstanding and the programs to be user friendly. For the most part, when I have called the customer service line, I have received prompt and friendly service. Cons: Unfortunately for the transition of 3 of our company codes, we had a rather negative experience. There were significant transition and year end errors that resulted in a very large amount of extra work on our end that needed to be performed. The issue was brought up to the customer service representative in charge of the account and no action was taken. The issue was escalated to her superior and we did not receive an acceptable response from them either. We also feel that for the functionality of the software, it is expensive. Recommendations to other buyers: I think that it is important for others to obtain information and reviews on the satisfaction of other customers when evaluating this software. Is ADP for your organization? Cons: It can be very difficult to store any data on the site in a portal type setup. It would be worth considering having the data storage capability via Cloud technology. It would be practical to increase the amount of features on the mobile app, to be consistent with those on the desktop application. Pros: ADP is one of many human resource software solutions that I have used. It provides access to all HR functions in one place, allowing employees to manager PTO, required documents, pay statements etc. The one stop solution is very beneficial. Cons: The solution is not very intuitive and takes awhile to figure out how to navigate. While this is not the end of the world, it can be frustrating for new users. A great step in the right direction, but some room for improvements. Pros: I know our payroll department has found it to be one of the most useful software programs that they have used over the years. From the HR side, ADP Workforce now is a little more focused on the payroll tracking than it is from an HRIS perspective. It would be nice to have the option of pushing information into ADP as well, but from my understanding. At this time ADP is only working with pushing information out of ADP into another system. Cons: Specifically some of the fields are not as adaptable to help with our reporting needs. Additionally, the reporting set up is a little time consuming. Most of the time I end up just selecting the fields I need, and then do a large data dump, because it is too difficult to manipulate the data within the ADP system. Recommendations to other buyers: Invest in the onsite set-up help for things like workflows and best practices. Also, attend as many of the free training courses as possible. That free resource is a great way to help guide you through some of the additional features are that you may not have originally asked for with ADP. It is a great way to get to test some of the software add-ons in the training setting while still being instructor led. Comments: We utilize ADP Workforce Now and there have been some hiccups along the way. The customer service team is diligent in responding to any issues that have occurred and is always professional and friendly. I'm sure that having to answer the same questions and supporting the client in all matters ADP can be mundane and sometimes challenging. Not once have I ever felt that my questions or issues are unimportant. Even though the product is good, customer service can make or break solid relationships. Kudos to ADP for cultivating a culture of client satisfaction. Pros: The product is fairly straightforward and the database allows you to collect all the employee data in one place to access easily. There are several features to the program and the report selections are aligned with our company needs. Cons: Our plant is located in the Midwest but our customer service support team is located on the east coast (our corporate office is in RI). There has been, on occasion, the inability to reach support because of the time difference. The cost of some of the modules has prohibited us to purchase. Recommendations to other buyers: ADP is a good program for managing payroll and some HR functions. Pros: I do like the fact that ADP offers many different modules so that you can consolidate all of your needs in one program. Cons: the product itself is great but their are instances where we have to get creative and look at work arounds for certain situations. for example, we have an issue where ADP does not the capability of reading our merit increases and teeing them back into payroll(at the moment due to our version). This does become a haste because we do pay outside vendors to help resolve the situation and act as a middleman. Recommendations to other buyers: When deciding to purchase this product. Always do a full demo and really assess what your primary needs are. For payroll, it is a great tool. On the recruiting side, take a look at other ATS software for comparison. Cons: I really don't know what else I would ask for in a payroll system. I would like to not have to download the reports to see them every time I want to see them, and maybe when I do download then they could be labeled with dates rather than right now they all have exactly the same name. Pros: I love how easy it is to see all of my timecard punches and pay statements on the website. Everything's easy to locate and use. Cons: The mobile app is basically useless as it doesn't even let me view my pay stubs. It's just a blank white screen. Pros: As an end user of this software I was very pleased. The platform is user friendly and pages load quickly. You are able to access the majority of your self-serve human resource needs; update personal information, print taxes documents and look at historic payroll are all within reach. Cons: Overall I enjoy using this software. It's not flashy like other platforms, but it gets the job done. Pros: Easy to use once you get use to it and have some training. Very simple once you log in, review what is needed. Cons: Need training to be able to get around site. There are a lot of tabs that need to be learned, but once you have them, its easy. Pros: This is used by almost every employeer I've had so it's nice to have a familiar program from job to job. Cons: I think the clocking in and out could be improved. It's not the most clear and intuitive piece of software I've ever used. Comments: Upgrades and support for upgrades are terrific. Pros: Best product on the market. I have used in several companies and it will always be my go to. Ease of use, excellent reports, customization as well, great customer service and support. Cons: Tutorials are rather lengthy and should get to the point. Can be hard to find a specific tutorial. Once found they are generally helpful. Cons: I haven't found any issues using ADP vantage so far, everything has been pretty easy to learn and use. Comments: Six months experience as user migrated over from legacy ADP product Virtual Edge. Pros: 1. 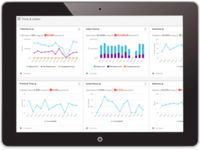 Dashboard style, access to data for requisitions and candidates in one place. 2. Better communication features than legacy platform. 3. More user control for configuration than some other platforms. 4. Very cost effective. Cons: 1. Multiple copies of the same stored documents with different names - confusing for users. 2. Very difficult to sort order fields reporting in created queries. 3. System has quirks for documentation such as offer letters can't date stamp when e-signature is given, but other side by side same format documents allow for this. 5. System allows for a lot of client configuration but getting to the source field for changes is very difficult for non heavy site admins. Recommendations to other buyers: 1. If user ease is focus, compare to alternative systems before selection. 2. If cost is not barrier, and there is time to train fully, it can be a good option. Pros: The solution is cloud based which helps increase the productivity of employees and managers as time sheets can be filled and approved from anywhere while on the go as well. It also offers its APIs so that companies can integrate ADP vantage HCM modules with their existing enterprise solutions. Cons: ADP Vantage HCM is not very flexible to be customized.Customizing the reports is not very intuitive and requires considerable experience with the solution. It provides mobile support but the mobile application currently support iOS only.With a large number of employees on Android devices, the mobile application use gets really limited in our enterprise. Recommendations to other buyers: It is an intelligent end to end software suite which can manage all processes of an HR function. We have experienced continuous uptime except a few cases which validates the use of cloud based solutions for critical business functions. Small and medium sized companies who are looking for a smart HR solution at a decent price should definitely consider ADP Vantage HCM. Pros: ADP Vantage is well equipped to handle the HRIS needs of companies large and small. The support from ADPs national network is also timely and effective for the most part. Cons: The interface is poorly designed. Simple and common tasks, in some cases, are terribly convoluted and time consuming. Some components are dated and in serious need of updates. Pros: Very reliable platform to run payroll from small to huge number of employees. HR Advance is always a plus not only you have web information and consulting but you always have a an HR representative advisor assigned. Cons: The system is a little complicated when running payrolls with a lot of extras -deductions, etc. Payments out of schedule have to be handle by them. Everything must be pre-configured and you have little or nothing access to configure extras. Recommendations to other buyers: For small companies watch for the cost of such a complete system. At the end you find you cannot afford such an expensive product; that happened to us. Pros: ADP Totalsource is fine to use (which I used with a previous employer) but ADP Workforce (which we currently use now) needs a lot of improvements. Cons: Customer service - you don't get a designated representative and only get a case number to follow up on issues which isn't helpful if you need to call back. You will explain the same problem to a differenct representative. ADP Portal - the different systems aren't as user friendly as they should be, different systems do not communicate to eachother correctly if at all and new hire entry takes too long. Reporting - the custom reporting option is too diffucult to use and when errors are returned you would need to know computer coding to decipher it. Payroll reporting needs a facelift as well. Payroll - preview takes upwards of 15+ minutes to be returned and can take longer if there is an issue. You are not notified of issues unless you reach out for your preview to be forced through. Time and Attendance - the layout has not been changed in the 5-6 years that I've used it. Change the format and add new things that the customer has requested. Build out the system more. Recommendations to other buyers: Listen to your customers and add new software options within the portal. The improvements and changes are slow and often disappointing. Pros: Vantage is a good solution for larger companies and has good integration with recruiting and onboarding which helped us streamline some of our processes. Cons: There was a steep learning curve for our managers, but ultimately we were able to get everything up and running smoothly. Pros: I like the ease of being able to clock-in and clock-out for work. I like the ability to go in and see my accrued vacation and sick time. Cons: sometimes I have issues with the program freezing up or not recording my time stamp correctly when I clock-in or clock-out. Pros: I love the fingerprint touch feature as well as being able to access your account anytime or anywhere. Cons: At times the software does not load quick enough. Time punches can be easily be duplicated accidentally when trying to punch in or out. Pros: The ability to have everything in once place, and integrate the systems. Cons: Some features are missing. I'd like to see a better ATS system, as well as an all online on-boarding system. Since ADP doesn't offer all of the features we need, I had to use other vendors. I would prefer to stay with ADP. I also wish they told us when new products came out, I feel like I have to ask my sales persons when I want something. I might want something, but not know it yet. Recommendations to other buyers: I would encourage you to ask current need questions and future need questions. Place requests for products you would like to see. Over the years we've seen ADP come up with a lot of new products that we wanted years ago, and have been requesting them. They do listen! Pros: I like the fact that it is reliable and it takes the concern about having taxes properly filed and paid taken care of. Cons: Biggest issue for me is that at times I have needed help with an issue and sat in a call cue for an hour only to have the rep hang up on the call when they pick up, meaning I had to wait another hour. The wait times are not bad all the time, but at year end they can be very long. Recommendations to other buyers: I think that ADP is certainly one of the leaders in payroll services and as a result you can count on them and their service. Comments: If the app features that are shown were all working it would be great!! Pros: The system is fairly easy to use to identify paycheck information on the desktop version. I like getting an alert about my pay amount in the app. Cons: The app doesn't provide much info beyond pay, it doesn't show paid time off accumulations or requested time off which would be nice. The desktop version is not intuitive, you have to hunt and peck to find what you need. When we signed up they had a great promotion going and they seem to offer promotions very similar all the time. Pros: First 3 months were free and can cancel at anytime, I would recommend them to other business owners. Has been a reliable service but support has declined over the years. Pros: Operationally the payroll systems are reliable and efficient. Payroll is always delivered on time. Canned reporting is good. Custom reporting is powerful but complicated to use. Cons: Phone / Technical Support has steadily declined over the year. Support staff seems overloaded. Also, we seem to get a new service representative at least once a year. The custom report writer is somewhat complicated .... not for a novice. Recommendations to other buyers: Be sure of what you need and the cost of the various modules. Comments: We converted to ADP this past March after positive recommendations from a couple of colleagues that have been on the platform for a few years. Our implementation was an absolute nightmare. We spent much more time, energy, resources and money on it than should have been necessary. The unfortunate part is that as of August, the wrinkles still had not been ironed out. For example, at implementation we received emails from an implementation specialist at the company recommending us to purchase a certain tablet to use at all our locations for the time keeping system. We went ahead and purchased them, which was costly, only to find out after countless hours on the phone with support and many frustrated employees, that ADP does not support that tablet. Payroll is one thing that cannot be inaccurate and I feel like making the switch we had more errors in the last 6 months than we had in the last 10 years combined. Many of them were completely avoidable had the implementation been done correctly. We also have a special excel document that we have created just to manage all the cases that we have with ADP, because we would have so many at one time that the only way we could manage the follow up was to track it ourselves. Unfortunately, for a small company like we are, we did not have the manpower to take on a failed transition and so we are currently looking to make a switch to a different platform. Recommendations to other buyers: I would not recommend switching to ADP unless you have excessive amount of time and energy to devote to making sure your implementation is up and running months in advance before you need to go live. ADP does what I need it to do. Payroll. Pros: I enjoy the new dashboard. It is user friendly and provides an easy and quick overall view of your payroll summary. Cons: I am not very satisfied with the customer support I receive. I have called multiple times on the same exact issue speaking to several different representatives to finally get it resolved. Recommendations to other buyers: Evaluate cost per component. Other companies offer the same and more than what ADP offers (ACA compliance, reporting, etc...) for a significantly lower cost with a dedicated account manager to handle customer support issues. ADP may offer several bells and whistles that may seem enticing, but are billed per component/module. Other companies may offer the same components as part of their full package cost. Pros: ADP Vantage HCM seems to be a very smart solution which auto suggests a lot of logical actions. In case, an employee is getting promoted to a new position, it automatically recommends to add people who report to him, change various roles and permissions is talent management and other systems,etc. With a lot of different modules linked together, it reduces a lot of manual effort. Cons: The customer service is not up to the standards. We have faced issues with customer service while implementation. Their people overseeing the implementation did not seem to have an in-depth know-how of the solution. Recommendations to other buyers: I would suggest anyone looking for ADP vantage HCM as the complete solution for HCM lifecycle to start with module by module implementation rather than a big-bang approach. My implementation experience was not satisfactory. Pros: Good to have this sort of thing automated, easier to track than by paper. Cons: The fact that before ADP, I just had to tell our office manager what time I wanted to take, now I have to go on to a system that can be a challenge at times to navigate to do so. Overall: ADP Vantage helps us track employee use of time, etc. I've found the system somewhat challenging, especially if I put in for PTO and need to retract it. Could be more user-friendly. Pros: Payroll, I love the payroll product, it is very user friendly and any time that there is an issue, the customer services reps are available to handle the calls and find solutions right away. Cons: It is not that I don't like the product, however the Time and Attendance product is not really conducive for the business that we are in. Recommendations to other buyers: Be open and honest about the products that you are familiar with so that changes can be looked at if you feel they need to be. Pros: ADP Vantage HCM allows me to access my payslips, tax forms and investment declarations from a single portal.I can print various bonafide certificates right from the portal without bothering anyone from the HR department. This has enabled me to perform a lot of tasks without depending on anyone else.Moreover, mobile applications allow me to approve the time sheets of my team members even when I am out of office. Cons: There is a lot of scope of improvement with Vantage HCM. It should make some changes automatically when a certain field is updated or at least recommend the changes. For example, if an employee is moving to a different state and when the State is updated in the HR system, tax related calculations should automatically get updated. This does not happen currently. Recommendations to other buyers: ADP Vantage HCM integrates all the major areas of HCM function. For small companies, this means less number of IT people are required to make different systems for each function integrate. This allows small and medium businesses to focus more on their core competency rather than HR functions. Further, being a SaaS solution, it is relatively cheaper than an on-premise solution. Good software depending on the need. Pros: The HRIS seems pretty robust. it has some small flaws that are very surprising for a software vendor of this size. its good for simpler payrolls. Cons: The fact that they do not have a dedicated account rep. When there is an issue, you get sent from one person to another and the problem has not been tracked, so you end up repeating it over and over again. Recommendations to other buyers: Look for in depth demos. Get into a lot of detail with the payroll system. Cons: Many are not user friendly and support is 50/50. Some are great and some waste your time like no other. Recommendations to other buyers: It is a great option, but there are better. Get it for payroll. If you can afford better get better. Pros: The robustness of the system. There were many additional modules such as compensation, learning, in addition to the core HR. Cons: The system is clunky and pieced together and is difficult to navigate. The customer service has gone from bad to worse and the COBRA connection and Carrier Connections teams were difficult to communicate with. They "nickel and dime" the customer with add on's. The Account Manager was no where to be found and "annual system audits" they promise never happened in the 3 years I have been with them. Switching to another vendor as of this writing. Do your homework! Recommendations to other buyers: I was one of the BETA customers and advocate who referred at least 3 other customers to them. One would have thought they would have provided better customer support. However, after last Enrollment period and COBRA connections, the fiasco associated with lack of ADP staff training, no response from Account Relationship Manager who was missing in action most of time and expense price tag, am making the decision to convert to another vendor who is more responsive. Pros: The interface was extremely easy to navigate and was intuitive. You didn't have to have a degree to use it because it just required some common sense. Cons: Kind of expensive but worth it. I feel like it could have been a little more helpful with password recovery rather than just locking people out. Pros: There's nothing to like. This is the most non-intuitive worthless application I've ever had the misfortune of using. Cons: Where to start? It's slow, it's convoluted, it's completely non intuitive, it glitches for no apparent reason, functions (and I use the term loosely) get randomly locked out at different levels, the defaults originally installed are ridiculous, I could go on and on. This is what happens when you think you're too big to fail. Get it together Carlos or your competitors are going to eat your lunch even worse than they are now. Overall: My overall experience after more than a year of trying to use this antiquated, kludged up POS is that it must be horrendously cheap for anyone to actually decide to switch to it. Pros: I like all the functionality they offer and consistent and easily accessible support. Cons: The templates, job descriptions, and other resources available to HR Managers can be overly generic. The ADP Resource support staff can help you tailor them, but only to a certain extent. Recommendations to other buyers: I recommend that admins reach out to ensure they are receiving all the benefits the company is paying for and entitled to. Pros: Ease of use for both administrator and end user use, relatively well known among users, mobile app is easy to use and gives good information. Recommendations to other buyers: In-depth review, there is a lot of functionality missing. ADP offers a great product to manage payroll and more. Pros: ADP system is web-based so can access it anywhere anytime. It is very user friendly and help is just a phone call away. Also like the ad-hoc reports that you are able to generate. Cons: ADP system has multiple portals and can only access one portal at a time. Recommendations to other buyers: ADP can make your job easier by tracking and maintaining information and save you lots of time with their ad-hoc reports.